India-Vietnam relations have been exceptionally friendly and cordial since their inception. The two countries have been historically linked through deep cultural bonds, ethical beliefs and their people share similar memories of struggle for liberation from foreign rule and of national struggle for independence. Our political leadership has shared great personal rapport and laid a strong foundation for a partnership which is prospering across all fora. Pandit Jawaharlal Nehru was one of the first visitors to Vietnam after its victory against the French at Dien Bien Phu in 1954. President Ho Chi Minh visited India in February 1958 on an 11-day State Visit. President Rajendra Prasad visited Vietnam in 1959. Several high-level bilateral visits have taken place since the establishment of full diplomatic relations in January 1972. Vice President Hamid Ansari visited Hanoi and Ho Chi Minh City in January 2013 for the closing ceremony of the Year of Friendship to commemorate 40 years of diplomatic relations. President Pranab Mukherjee undertook a State Visit to Vietnam (including HCM City) in September 2014. EAM Smt. Sushma Swaraj visited Hanoi from 24-26 August 2014 to attend the 3rd ASEAN-India Network of Think Tanks Meeting. Raksha Mantri Manohar Parrikar undertook an official visit to Vietnam from 5-7 June 2016. Minister of State for External Affairs General (Dr.) V K Singh visited Vietnam from 20-23 April 2017; he was in HCM City from 21-23 April to participate in the celebrations commemorating 45th anniversary of establishment of diplomatic relations between the two countries (1972-2017). Minister of State for Commerce and Industry, Smt. Nirmala Sitharaman visited Vietnam from 21-23 May 2017 to attend the 3rd RCEP Inter-sessional meeting. Raksha Mantri Mrs. Nirmala Sitharaman was in HCM City from 14-15 June 2018. Prime Minister Nguyen Tan Dung visited India in December 2012 for the India-ASEAN Commemorative Summit. Le Thanh Hai, Member of Politburo and Party Secretary of the HCMC visited India in March 2013. CPV General Secretary Nguyen Phu Trong undertook a State Visit to India from 19-22 November 2013. PM Nguyen Tan Dung undertook a State Visit to India in October 2014. Vietnamese Defence Minister General PhungQuang Thanh visited India in May 2015. Minister of Defence of Vietnam Sr. Lt. Gen. Ngo Xuan Lich visited India from 3-6 December 2016. Minister of Information and Communication and Chairman of the Vietnam-India Friendship Association Dr. Truong Minh Tuan visited India from 26-29 March 2017. Deputy Prime Minister and Foreign Minister Pham Binh Minh undertook a bilateral visit to India from 3-5 July 2017 and also attended the IX Delhi Dialogue. Deputy Minister of Foreign Affairs Nguyen Quoc Dung, led a high-ranking Vietnamese delegation to attend the 10th Delhi Dialogue in July 2018. Trade and economic linkages have been identified as a priority by the leaderships of both countries. India’s thrust under the ‘Act East’ policy combined with Vietnam’s growing engagement within the region and with India has paid rich dividends. Vietnam is an important regional partner in South East Asia. Both countries closely cooperate in various regional fora such as ASEAN, East Asia Summit, Mekong Ganga Cooperation, Asia Europe Meeting (ASEM) besides UN and WTO. India’s relations with Vietnam are marked by growing economic and commercial engagement. India is among the top ten trading partners of Vietnam. The official data of Ministry of Commerce in India, shows that the total bilateral trade between India and Vietnam rose from US$10.135 billion during April 2016 –March 2017 (Indian Exports US$6.815 billion, Imports US$3.320 billion) to US$12.831 billion during April 2017-March 2018 (Indian Exports US$7.813billion, Imports US$5.018billion). A significant jump of 26.96 %. During the visit of the Party General Secretary H.E. 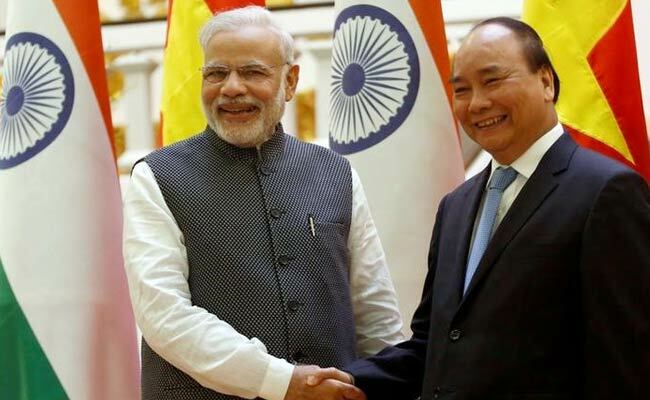 Nguyen PhuTrong to India in November 2013, both sides agreed to increase trade to US$ 15 billion by 2020; this has been reiterated during the visits of Prime Minister of India to Vietnam in September, 2016 and recent visits of Prime Minister Nguyen Xuan Phuc to India in January 2018 and President Tran Dai Quang in March 2018. India and Vietnam are members of the ASEAN India Free Trade Agreement. Garments and textiles, pharmaceuticals, agro-commodities, leather & footwear, engineering and renewable energy have been identified as priority areas for cooperation. Major export commodities from India are machinery and equipment, seafood, pharmaceuticals, cottons of all kinds, automobiles, textiles and leather accessories, cattle feed ingredient, chemicals, plastic resins, products of chemicals, fibres of all kinds, steel of all kinds, fabrics of all kinds, ordinary metals and jewellery and precious stones. Main items of imports from Vietnam are mobile phones and accessories, computers and electronics hardware, machinery and equipments, chemicals, rubber, ordinary metals, wood and wooden products, fibres of all kinds, pepper, means of transport, products of steels, coffee, footwear, products of chemicals and polymers and resins. According to the Foreign Investment Agency, in 2017, India registered 44 fresh projects with total capital of US$151.38 million. As such, India has 169 valid projects with total invested capital of US$756.37 million, ranking 27th among countries and territories investing in Vietnam. It is estimated that investment by Indian companies (including that from third countries) into Vietnam is over US$ 1.6 billion. Indian companies have invested in oil and gas exploration, mineral exploration and processing, sugar manufacturing, agro-chemicals, IT, and agricultural processing. TATA group is constructing a Coffee processing plant in Binh Duong Province, an investment of approximately US$ 63 million. Vietnam investment in India: According to the Foreign Investment Agency, Vietnam has six investment projects in India with total investment of US$ 28.55 million. Vietnamese companies have invested in the area of pharmaceuticals, Information technology, chemicals and building materials. Most remarkable project among them is the project of M/s Rohto Mentholantum Vietnam vide Rohto Pharma (India) Pvt. Ltd., in 2011 with total investment of US$22.8 million. Direct Flights: An Air Service Agreement was signed in November 2013, during the visit of Party General Secretary H.E. Mr Nguyen PhuTrong to India. Connectivity remains an important element for furthering our investment cooperation & tourism. In this vein, a Memorandum of Understanding was signed between India’s national Carrier Air India and Vietjet Air of Vietnam in December 2016 during the visit of Chairperson of National Assembly of Vietnam Nguyen Thi Kim Ngan. During Vietnamese President Tran Dai Quang’s visit to India in March 2018, Vietjet Air announced to launch direct flights between India and Vietnam and they are expected to commence by the end of 2018. Indian Banks in Vietnam: In November 2012, Reserve Bank of India and State Bank of Vietnam signed a Memorandum of Understanding on banking supervision, creating a good legal frame work for Indian banks and Vietnamese banks to set up branch offices in the respective countries. The Bank of India Branch Ho Chi Minh City officially inaugurated its first branch in Ho Chi Minh City, Vietnam on July 22, 2016. The opening Bank of India Ho Chi Minh city branch would cater to the needs of the investment projects as well as exporters and importers of both the countries, it also gives support to small and medium sized enterprises. Several business delegations from India and vice-versa, visited each other’s country for participating in business fairs/exhibitions/shows and to promote trade and investment. 1. The Plastics Export Promotion Council (PLEXCONCIL), India brought a large delegation of 54 Indian Companies to participate in the 2nd edition of ‘PLASTICS VIETNAM’ from 22-24 February 2017, an International Plastics Exhibition held at the Saigon Exhibition and Convention Center (SECC), District 7, Ho Chi Minh City. 2. A delegation of 47 leading Indian companies led by ASSOCHAM participated in ‘Propack Vietnam 2017’ at SECC, District 7, HCMC from 21-23 March 2017. 4. Representatives of Energy Efficiency Services Ltd. (EESL) visited Can Tho City and Ho Chi Minh City (4-5 May) for discussing energy efficient LED street lighting / distribution. 6. The Council for Leather Exports - CLE, India headed a delegation of over 35 members - leading manufacturers, exporters of finished leather, furniture upholstery leather and leather goods to participate in the 19th International Shoes and Leather Exhibition – Vietnam 2017 from 12 – 14 July, 2017 at SECC, Ho Chi Minh City. 7. The Indian Textile Accessories & Machinery Manufacturers’ Association – ITAMMA headed a delegation of eight members - manufacturers/suppliers of textile machinery, equipment and accessories to visit Ho Chi Minh City from 19-22 July 2017. 8. An Indian Business Delegation led by FICCI and the Department of Industries and Commerce, Government of Kerala participated in the 21st International Exhibition on Viet Food & Beverage, Propack Vietnam 2017 from 9-11/8/2017 at SECC, HCM City. 9. Krishnapatnam Port Container Terminal (KPCT), Andhra Pradesh organized a Trade Meet on shipping services at Park Hyatt Hotel on 29th August 2017. 11. SECONA brought about 40 Indian security consultancies in Ho Chi Minh City, holding ASCM on 9-10 November 2017. 12. TEXPROCIL led its nine members to participate in the 17th Vietnam International Textile and Garment Industry Exhibition and the 17th Vietnam International Textile & Apparel Accessories Exhibition- VTG 2017 at SECC, Ho Chi Minh City from 22-25 November, 2017. 13. A Conference on Agricultural Cooperation between India and Mekong Delta Provinces co-organized by Tien Giang People’s Committee, EOI, Hanoi and CGI, HCMC in My Tho City, Tien Giang on 28 November 2017. APEDA Chairman, MPEDA Secretary, Chairman and Vice Chairman IOPEPC along with Indian official and business delegates participated in the meet. 14. CII delegation of leading Indian enterprieses visited Ho Chi Minh City from 19-20 December 2017. 15. 43 Indian companies participated in COMPLAST VIETNAM 2018 held at SECC, Ho Chi Minh City from 10-12 January 2018. 16. A 20 student group from the Apparel Training and Design Center, Tirupur,Tamilnadu visited HCMC to study textile industry. 18. A 44 member business delegation from Federation of Paper Traders Associations of India (FPTA) visited HCMC in February 2018, to develop business prospects. Consulate held a B2B meet. 21. A Business delegation from Chennai (Rotary Club of Madras) visited HCM City for exploring business opportunities. 23. Ministry of Tourism, Government of India in coordination with CGI, HCMC organized an “Incredible India Road show on 8th May, 2018 at Park Hyatt Hotel, HCMC. Secretary, Ministry of Tourism led the official delegation; 20 Indian Tour Operators visited for B2B with Vietnamese Co’s. 26. About 40 Indian companies led by CHEMEXCIL participated in Coatings Expo Vietnam 2018 at SECC, HCMC form 13-15 June, 2018. A few Indian companies also exhibited in the concurrent shows - Paper Vietnam 2018 (07 Indian companies) and Rubber & Tyre Vietnam 2018 (1 Indian company). 27. A Denim and Jeans Show was held at Riverside Palace Ho Chi Minh City from 27-28 June, 2018. 6 Indian companies participated, out of the 40 exhibitors. 28. Three Indian companies participated in MTA Vietnam 2018 (Precision Engineering, Machine Tools and Metalworking Exhibition) & Conference held in SECC, HCMC from 3 - 6 July, 2018. 30. Three Indian companies, CHAL MEDIX, UFLEX, RAKESH SANDAL participated in Vietbeauty 2018 from 19-21 July, 2018 at SECC, HCMC. 2. The Department of Tourism Ho Chi Minh City held Vietnam – Ho Chi Minh City Tourism Roadshow in Mumbai and New Delhi from 19th to 25th February 2017 to promote both ways India-Vietnam tourism. 5. A 19 member Vietnam Textile and Apparel Association (VITAS) delegation attended the International Textile Fair Textiles India 2017 from 27 June to 2 July 2017, at Ahmedabad, Gujarat. The Vietnamese delegation was sponsored by SRTEPC. 6. A 15 member group from FOSCO and M/s Nha Vui, member of the Young Business Association (YBA) participated in the 2nd Vibrant Ceramic Expo & Summit 2017 at Gandhinagar, Gujarat, India from 16-19 November, 2017 under the hospitality of M/s Morbi Certamics Association and Octagon Communication Pvt. 7. Three members from Viet Nam News and Fidi Tour participated in the 6th North East International Tourism Mart 2017 at Guwahati, India from 5th – 7th December 2017. Their participation was sponsored by the Ministry of Tourism, Government of India. 10. A 12 member delegation from the Department of Tourism Ho Chi Minh City participated in South Asia’s Leading Travel & Tourism Exhibition (SATTE) in New Delhi from 31 Jan. to 2 February, 2018. Lines of Credit: Since 1976, India has offered several Lines of Credit (LoCs) to Vietnam over the years on concessional terms and conditions.. The 16th LoC for US$ 45 million for Nam Chien hydropower project, executed by BHEL, has been completed. Indian Prime Minister Narendra Modi announced a new US$500 million credit line for deepening bilateral defence cooperation and a grant of US$5 million for constructing an Army Software park in Nha Trang during his visit in September 2016. Scholarships: Vietnam has been a large recipient of training programmes under Indian Technical and Economic Cooperation (ITEC) programme. Presently, 130 ITEC slots are being offered to Vietnam every year along with 24 scholarships under the General Cultural Scholarship Scheme (GCSS); 4 scholarships announced during PM Modi’s visit to Vietnam in September 2016 for Buddhist and Sanskrit studies, 14 scholarships under the Educational Exchange Programme (EEP) and 10 scholarships under the MGC Scholarship Scheme. India has also been providing assistance to Vietnam within the ASEAN framework. Under the Mekong Ganga Cooperation, India announced a Revolving Fund with an annual contribution of USD 1 million (USD 250,000 per country). Under this 5 Quick Impact Projects were implemented in the financial year 2016-17, in 5 provinces of Vietnam. A new set of MoUs are under discussion for 5 QIPs to be executed in 2017-18. These include (i) Construction of Cau Chua Moi bridge in HoDacKien Commune, Chau Thanh District, Soc Trang Province, Vietnam. (ii) Construction of Lac Son Primary School, Ca Na Commune, Thuan Nam District of NinhThuan Province (iii) One floor day boarding school canteen with 2 rooms – Bo Ly kindergarten – Tam Dao District-VinhPhuc Province (iv) Block of Classrooms – Van Lung Kindergarten – PhuTho town – PhuTho Province (v) Construction of Kindergarten at Hai Long Commune – Hai Hau District – Nam Dinh Province. * An Inter-Governmental Framework Agreement was signed between the two countries for Exploration and Use of Outer Space for Peaceful Purposes during the visit of Indian Prime Minister Narendra Modi in September 2016. The Implementing Arrangement between the Indian Space Research Organisation and Viet Nam Ministry of Natural Resources and Environment for Establishment of Satellite Tracking and Telemetry centre in Vietnam under the India-ASEAN Space Cooperation was signed during the visit of Vietnamese Prime Minister Nguyen Xuan Phuc to Delhi in January 2018..
* A Memorandum of Understanding between Centre for Development of Advanced Computing, Ministry of Electronics and IT, Government of India; and Posts and Telecommunications Institute of Technology (PTIT), Ministry of Information and Communications, Government of Vietnam has been signed for setting up of a sustainable IT infrastructure for advanced IT training under India- ASEAN Cooperation. :(Establishment of a Centre of Excellence for Software Development and Training (CESDT) at PTIT, Ho Chi Minh City). Conservation and restoration of Cham monuments: The Archaeological Survey of India is executing a conservation and restoration project at the UNESCO heritage site of My Son in Vietnam. The project has highlighted the old linkages of the Hindu Cham civilization between India and Vietnam. A MoU between India and Vietnam was signed on 10 October 2014. Archaeological Survey of India started the project at My Son in central Vietnam, in end-February 2017. The first working season continued till May 2017 during which the team was able to excavate and preserve many artefacts. The second working season for ASI team started in January 2018. The Institute for Indian and South-West Asian Studies under the aegis of the Vietnam Academy of Social Sciences was inaugurated in Hanoi on 7 January 2012 on the occasion of the 40th anniversary of establishment of full diplomatic relations. During President Pranab Mukherjee’s State Visit to Vietnam in September 2014, both Presidents inaugurated the Centre for Indian Studies at the Ho Chi Minh National Academy of Politics which is the apex institute for training cadres of the Communist Party of Vietnam. The Department of Oriental Studies, University of Social Sciences and Humaities of Vietnam, has a section on Indian Studies. An Indian Cultural Centre was established in Hanoi in September 2016 and was formally inaugurated on 20th April 2017 by MoS for External Affairs, Dr. V.K. Singh and the Deputy Minister of Culture, Sports and Tourism of Vietnam. There are three Hindu temples, and one mosque in HCM City; all built about a century ago, where devotees/worshippers still line-up to pray & give offerings to the almighty. These are symbols of our close people-to-people links from the past, when the Indian origin people were settled in greater numbers in HCM City; and even today are a point of attraction for Indian/PIO visitors. 4th International Day of Yoga (IDY) was celebrated in 11 Provinces of Vietnam, including Hanoi and Ho Chi Minh City. IDY celebrations attracted thousands of yoga enthusiasts in all the provinces and events were held during 16 June – 22 July 2018. The event in HCM City was covered live by popular HTV channel. Yoga is thus defining a new connect between Indian and Vietnamese traditions, as more and more Vietnamese identify with its healing aspects and the number of Yoga centres proliferates in HCM City and other provinces. In April 2017, during the visit of General (Rtd.) Dr.V K Singh, Minister of State for External Affairs, several cultural events were held in HCM City; including traditional Indian dances, performances by Indian Army Symphony band and launching of the third edition of Veda-Upanishad(Vietnamese translation). ICCR’s Bharatnatyam troupe led by Ms. Srilatha Vinod enthralled the Vietnamese audience in June 2018. The younger generation of Vietnamese is especially enamoured with bollywood dances and several Indian television serials dubbed in Vietnamese rule the TRP ratings on local TV channels. Though the majority of tourists from Vietnam to India are still attracted by the charm of the ‘Land of Buddha’. The estimated population of Indians living in Vietnam is about 3000, mostly in HCMC. The Indian community is vibrant, law-abiding, well-educated and prosperous. There has been a steady increase in the numbers of Indian professionals working in multinational companies in Vietnam as well as Indian tourists. Indian community makes its presence felt by organizing cultural events on the occasions of ‘Holi’, ‘Diwali’ and ‘Onam’ etc. Representatives of Indian businesses have knit themselves in an organization called Indian Business Chamber (INCHAM). INCHAM promotes trade and business interactions as well as leads in organizing the cultural events.